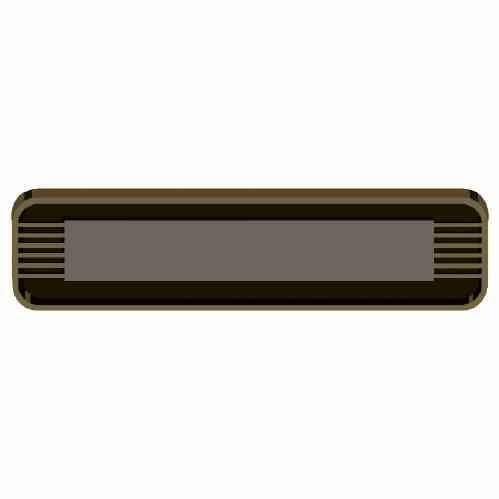 Engraved Nameplate Options are Subsurface Engraved and Surface Engraved. Subsurface Engraved is engraved from the back side. Surface Engraved is engraved on the top side. Choice of colors for each listed below. Choice of Type Styles - Times New Roman, Times New Roman Bold, Helvetica Regular, Helvetica Bold, Goudy Regular, Goudy Bold, Futura Regular, and Futura Bold. Choice of Text Alignment Options - Centered, Left Justified, and Right Justified. Aluminum Holders available in counter and wall styles in Gold, Silver and Black finishes. Holders and Nameplates sold separately. 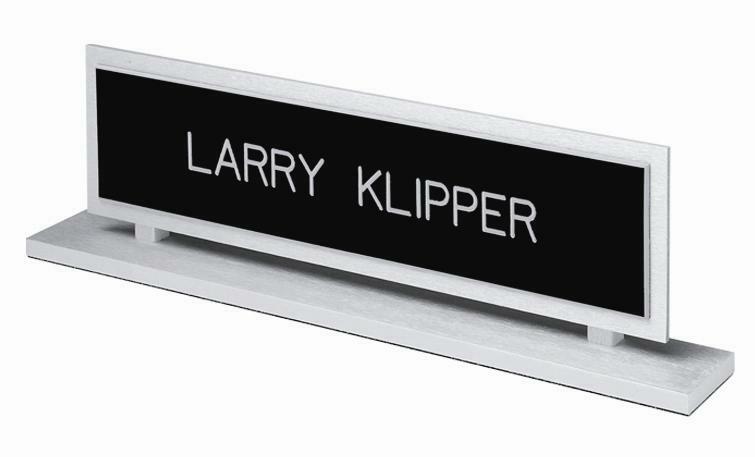 Nameplates 8"W X 2"H available in Subsurface Engraved or Surface Engraved per above. Black Acrylic Name Insert Holder can accomodate a single insert for front side viewing only or two inserts for front and back side viewing. Subsurface Engraved 8"W X 2"H Nameplates and Surface Engraved 8"W X 2"H Nameplates sold separately with details and colors per above. Front side imprint pictured on left. Back side imprint pictured on right. Clear Acrylic Frame. 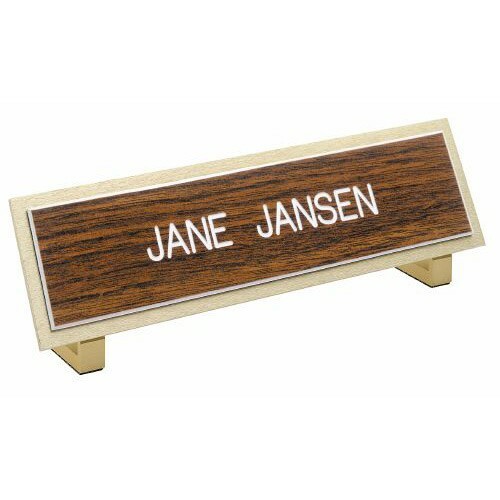 Name Insert can be your own printed material or surface engraved nameplate with details and color choices below. Frame size is 10"W X 2 1/2"H X 2 3/4"D. Surface Engraved Name Insert size is 10"W X 2"H.
Surface Engraved Name Insert, 10"W X 2"H, for Clear Acrylic Name Holder with Business Card Pocket, pictured above. Choice of colors listed below. Choice of Type Styles - Times New Roman, Times New Roman Bold, Helvetica Regular, Helvetica Bold, Goudy Regular, Goudy Bold, Futura Regular, and Futura Bold. Choice of Text Alignment Options - Centered, Left Justified, and Right Justified. Matte Black Nameplate Holders with Matte Black Name Inserts. Name Inserts - Screen Printed in white ink. Name Inserts sold separately from Holders. Specify imprint with order. Choice of Desk Sign or Desk Sign with Business Card Pocket. Solid wood base in mahogany finish. Includes 8"W X 2"H surface engraved nameplate in either gold insert with black letters or silver insert with black letters. Available with 1 or 2 lines of imprint. Specify imprint with order. 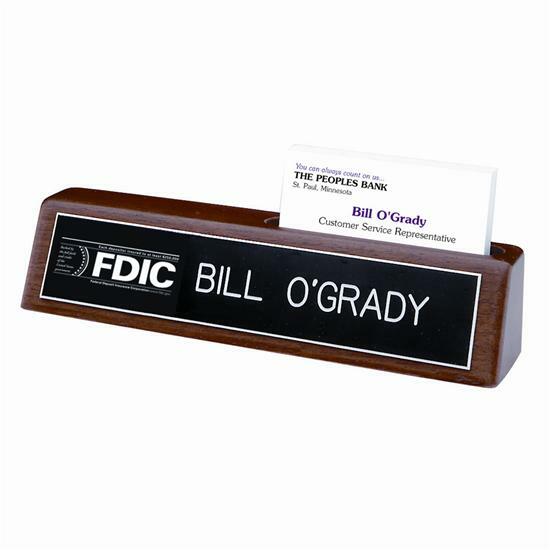 Available in 3 styles - Desk Sign only, Desk Sign with Business Card Holder, and Desk Sign with Business Card Holder and either FDIC Logo (pictured), NCUA Logo or Custom Logo Imprint. Desk Signs feature a solid wood base with a walnut finish, non-slip cork base. 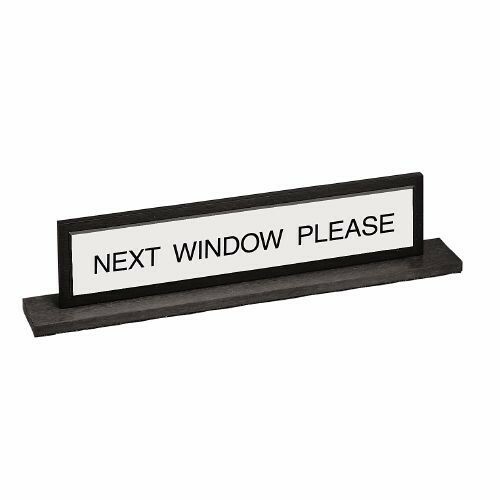 Desk Sign only and Desk Sign with Business Card Holder include Brass Nameplate with engraved black letters. 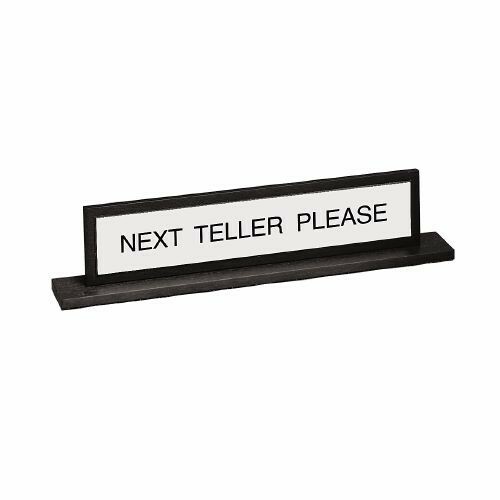 Desk Sign only and Desk Sign with Business Card Holder and either FDIC Logo, NCUA Logo or Custom Logo Imprint include Black Laminate Nameplate with white engraved letters. All signs available with one or two lines of imprint. Imprinting typefaces available are Gothic, Gothic Italic, Helvetica Medium, Helvetica Medium Italic, Clarendon, Clarendon Italic, Optima Bold, Optima Bold Italic, Times Bold, and Times Bold Italic. Lettering cases available are Upper and Lower case letters, All Upper case letters, or All lower case letters. Position on nameplate available in Centered or Flush Left. Walnut Desk Sign dimensions 10"W X 2 1/4"H X 1 3/4"D. Walnut Desk Sign with Business Card Holder dimensions are 8 1/4"W X 1 3/4"H X 1 3/4"D. Desk Sign with Business Card Holder and either FDIC Logo, NCUA Logo, or Custom Logo Imprint dimensions are 8 3/4"W X 1 3/4"H X 1 3/4"D. All Signs sold individually. Solid Hand-Cast Bronze Signs feature polished letters and borders. Signs sit securely in easel-style stands that include non-mar, non-slip felt pads. Signs accomodate up to 20 characters per line. Available in background colors - Statuary Bronze or Black Stippled. Signs available in either Gothic lettering style or Roman lettering style in Upper case letters and either Single Line or Double Line Imprint. Sign dimensions are 10"W X 2 1/2"H. Signs require 8 week delivery time. Signs sold individually. Solid acrylic desk bar in opaque black or translucent architectural bronze colors with square or radius corners and one or two lines of imprint in white vinyl letters. Base includes non-slip, non-mar rubberized cork. 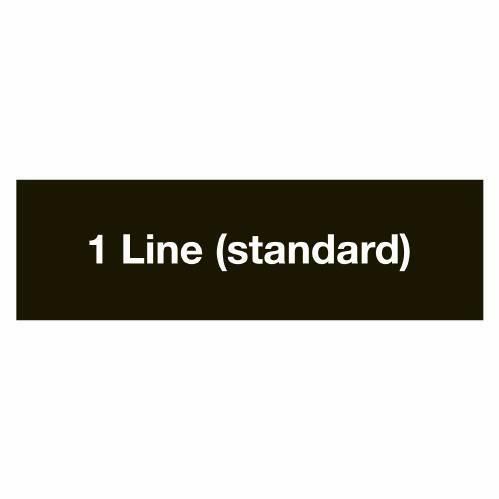 First line imprint letter size is 3/8". 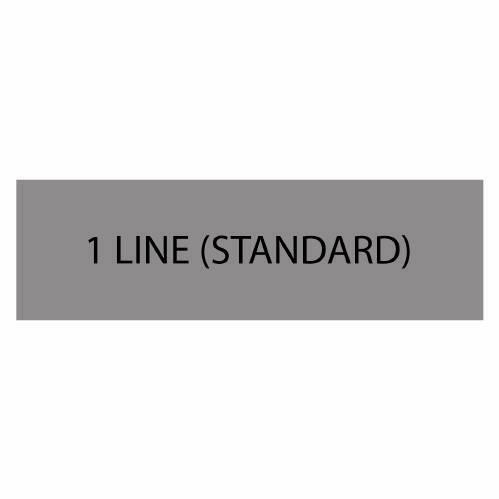 Second line imprint letter size is 1/4". Logo silk screen imprinting available per request. Logo imprint minimum order is 10 desk bars. Base dimensions are 9 1/2"W X 3/4"D X 1 3/4"H. Imprinting typefaces available are Helvetica Medium, Helvetica Medium Italic, Clarendon, Clarendon Italic, Optima Bold, Optima Bold Italic, Times Bold, and Times Bold Italic. Lettering cases available are Upper and Lower case letters, All Upper case letters, or All lower case letters. Position on nameplate available in Centered or Flush Left. Desk Bars sold individually. Aluminum Base and Backplate with Nameplates on each side attached by adhesive to the frame. Aluminum Frame colors are Black, Gold, and Silver. 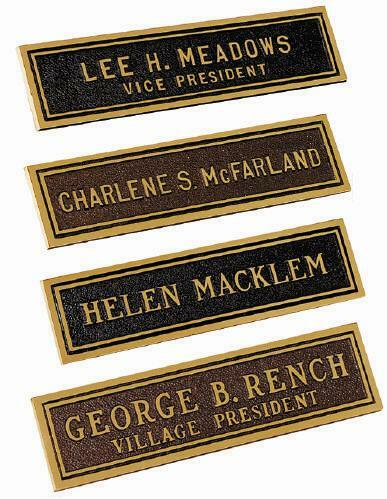 Nameplates are available in Engraved or Subsurface Engraved lettering styles. 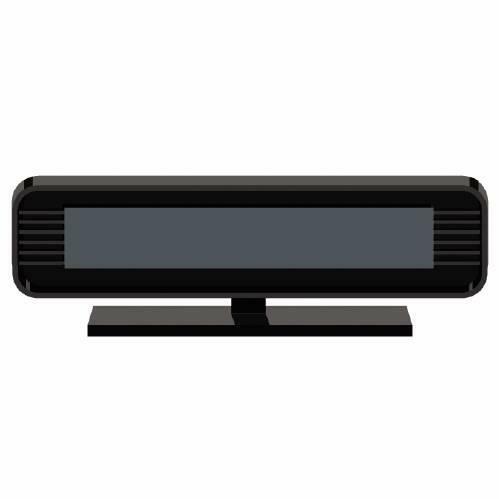 Front side imprint is personalized name imprint and Back side imprint is Next Teller Please, Next Window Please or Blank. Engraved Nameplate Inserts available in colors - Gray with black letters, Green with white letters, Cocoa with white letters, Black with white letters, Walnut with white letters, White with black letters, Red with white letters, Blue with white letters, Brown with white letters, Gold with black letters, and Silver with black letters. Subsurface Engraved Nameplate Inserts available in colors - Gray with black letters, Taupe with white letters, Black with white letters, White with black letters, Red with white letters, Blue with white letters, Brown with white letters, Almond with white letters, Bordeaux with white letters, Metallic Blue with black letters, and Gold with black letters. Imprinting typefaces available are Gothic, Gothic Italic, Helvetica Medium, Helvetica Medium Italic, Clarendon, Clarendon Italic, Optima Bold, Optima Bold Italic, Times Bold, and Times Bold Italic. Lettering cases available are Upper and Lower case letters, All Upper case letters, or All lower case letters. Position on nameplate available in Centered or Flush Left. 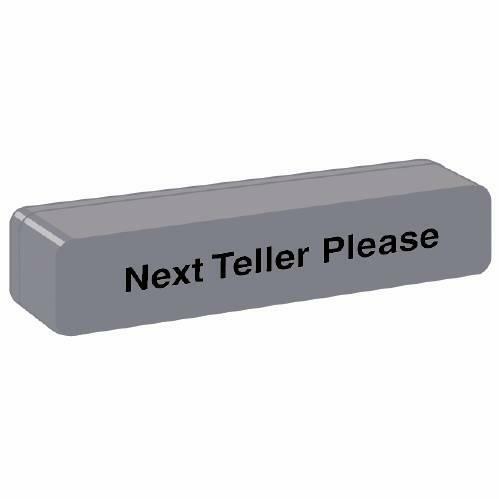 Base size is 10 1/2"W X 1 1/2"D X 1/4"H. Nameplate size is 8 1/2"W X 1/16"D X 1 1/2"H. Replacement Nameplates in Engraved or Subsurface Engraved styles available with adhesive back. 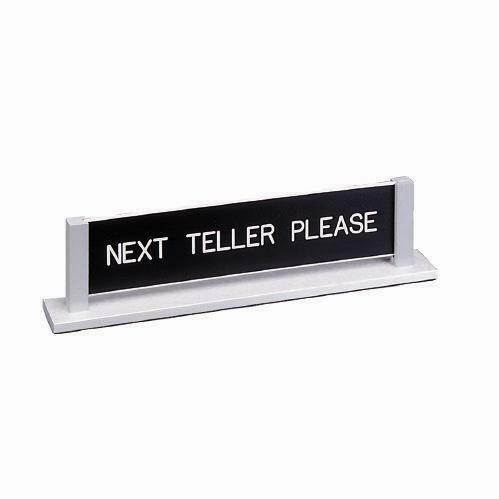 Teller Signs Double-Mount with Nameplate sold complete and Replacement Nameplates sold individually. Aluminum Frame with slotted upright frame posts. 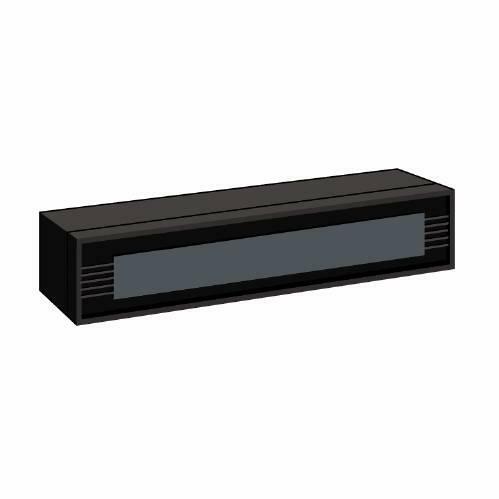 Engraved Nameplates feature personalized name imprint on one side with Next Teller Please, Next Window Please, or Custom Message on reverse side. Frame color is silver. Base size is 10 1/2"W X 1/4"H X 1 1/2'D. 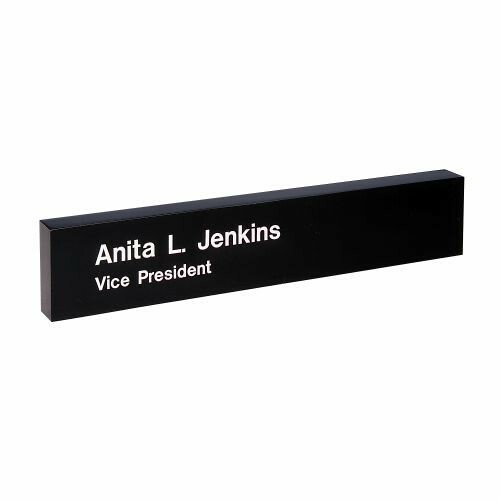 Nameplate size is 8 3/4"W X 2 5/8"H X 3/32"D. Name imprint available in one line or two lines of imprint. Engraved Nameplate Inserts available in colors - Gray with black letters, Green with white letters, Cocoa with white letters, Black with white letters, Walnut with white letters, White with black letters, Red with white letters, Blue with white letters, Brown with white letters, Gold with black letters, and Silver with black letters. Imprinting typefaces available are Gothic, Gothic Italic, Helvetica Medium, Helvetica Medium Italic, Clarendon, Clarendon Italic, Optima Bold, Optima Bold Italic, Times Bold, and Times Bold Italic. Lettering cases available are Upper and Lower case letters, All Upper case letters, or All lower case letters. Position on nameplate available in Centered or Flush Left. Replacement Nameplates in Engraved styles available. Teller Signs Reversible Slide-Post with Nameplate sold complete and Replacement Nameplates sold individually. Nameplate slides into aluminum holder which slides in and out of slotted upright posts of frame. Aluminum Frame color is silver. 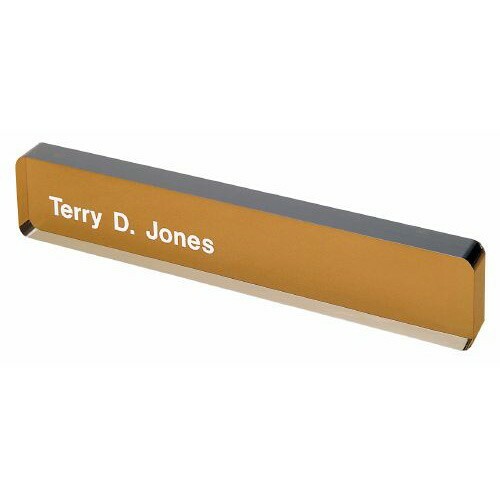 Base size is 11"W X 1 1/2"D. Nameplate size is 9"W X 2"H. Nameplates available in one or two lines of imprint. Nameplates available with Engraved or Subsurfaced Engraved lettering. Engraved Nameplate Inserts available in colors - Gray with black letters, Green with white letters, Cocoa with white letters, Black with white letters, Walnut with white letters, White with black letters, Red with white letters, Blue with white letters, Brown with white letters, Gold with black letters, and Silver with black letters. Subsurface Engraved Nameplate Inserts available in colors - Gray with black letters, Taupe with white letters, Black with white letters, White with black letters, Red with white letters, Blue with white letters, Brown with white letters, Almond with white letters, Bordeaux with white letters, Metallic Blue with black letters, and Gold with black letters. Imprinting typefaces available are Gothic, Gothic Italic, Helvetica Medium, Helvetica Medium Italic, Clarendon, Clarendon Italic, Optima Bold, Optima Bold Italic, Times Bold, and Times Bold Italic. Lettering cases available are Upper and Lower case letters, All Upper case letters, or All lower case letters. 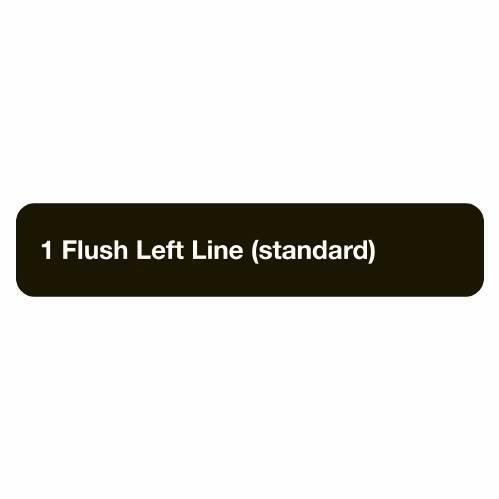 Position on nameplate available in Centered or Flush Left. Replacement Inserts in Engraved or Subsurface Engraved styles available. 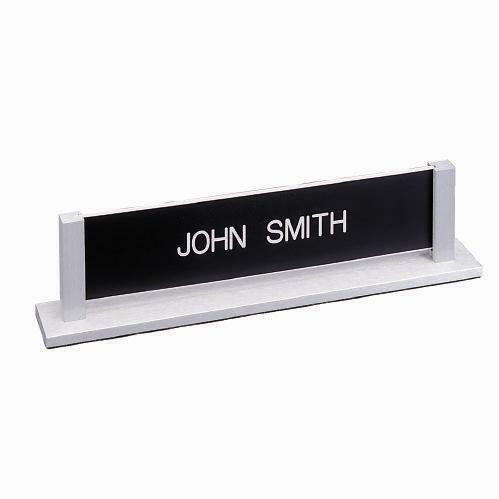 Desk Sign Slide-Post with Nameplate sold complete and Replacement Nameplates sold individually. Backplate mounted to base by two vertical posts with Nameplate mounted to backplate. Available in two frame colors - Black and Silver. 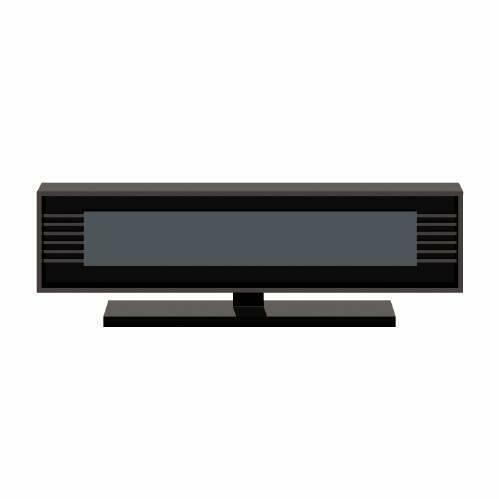 Base size is 10 1/2"W X 2 1/2"D. Backplate size is 9 1/2"W X 2 1/2"H. Nameplate size is 9"W X 2"H. Nameplates available in one or two lines of imprint. Nameplates available with Engraved or Subsurfaced Engraved lettering. Engraved Nameplate Inserts available in colors - Gray with black letters, Green with white letters, Cocoa with white letters, Black with white letters, Walnut with white letters, White with black letters, Red with white letters, Blue with white letters, Brown with white letters, Gold with black letters, and Silver with black letters. Subsurface Engraved Nameplate Inserts available in colors - Gray with black letters, Taupe with white letters, Black with white letters, White with black letters, Red with white letters, Blue with white letters, Brown with white letters, Almond with white letters, Bordeaux with white letters, Metallic Blue with black letters, and Gold with black letters. Imprinting typefaces available are Gothic, Gothic Italic, Helvetica Medium, Helvetica Medium Italic, Clarendon, Clarendon Italic, Optima Bold, Optima Bold Italic, Times Bold, and Times Bold Italic. Lettering cases available are Upper and Lower case letters, All Upper case letters, or All lower case letters. Position on nameplate available in Centered or Flush Left. Replacement Inserts in Engraved or Subsurface Engraved styles available. 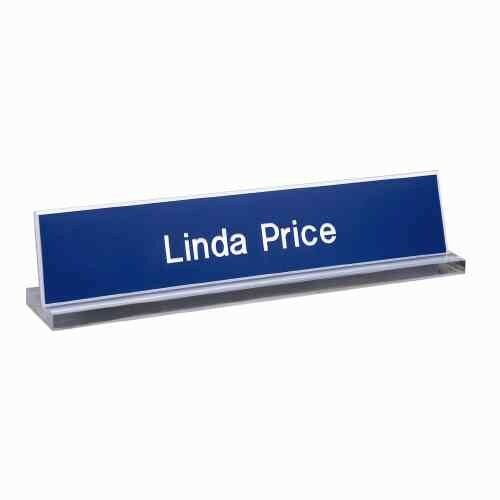 Desk Sign Upright with Nameplate sold complete and Replacement Nameplates sold individually. Sign face is set at an angle. Frame is available in three colors - Black, Gold and Silver. Frame size is 9 1/2"W X 2 1/2"H. Nameplate size is 9"W X 2"H. Name imprint available in one line or two lines of imprint. Engraved Nameplate Inserts available in colors - Gray with black letters, Green with white letters, Cocoa with white letters, Black with white letters, Walnut with white letters, White with black letters, Red with white letters, Blue with white letters, Brown with white letters, Gold with black letters, and Silver with black letters. Imprinting typefaces available are Gothic, Gothic Italic, Helvetica Medium, Helvetica Medium Italic, Clarendon, Clarendon Italic, Optima Bold, Optima Bold Italic, Times Bold, and Times Bold Italic. Lettering cases available are Upper and Lower case letters, All Upper case letters, or All lower case letters. Position on nameplate available in Centered or Flush Left. 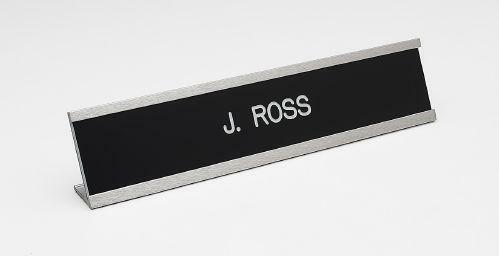 Replacement Nameplates in Engraved styles available. 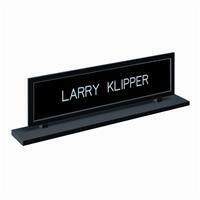 Desk Sign Custom with Nameplate sold complete and Replacement Nameplates sold individually. Aluminum Silver Frame available in either 8"W or 10"W sizes and non-slip cork base. Inserts slide in from either side. Inserts available with Engraved or Subsurface Engraved lettering. All signs available with one or two lines of imprint. Engraved Nameplate Inserts available in colors - Gray with black letters, Green with white letters, Cocoa with white letters, Black with white letters, Walnut with white letters, White with black letters, Red with white letters, Blue with white letters, Brown with white letters, Gold with black letters, and Silver with black letters. Subsurface Engraved Nameplate Inserts available in colors - Gray with black letters, Taupe with white letters, Black with white letters, White with black letters, Red with white letters, Blue with white letters, Brown with white letters, Almond with white letters, Bordeaux with white letters, Metallic Blue with black letters, and Gold with black letters. Imprinting typefaces available are Gothic, Gothic Italic, Helvetica Medium, Helvetica Medium Italic, Clarendon, Clarendon Italic, Optima Bold, Optima Bold Italic, Times Bold, and Times Bold Italic. Lettering cases available are Upper and Lower case letters, All Upper case letters, or All lower case letters. Position on nameplate available in Centered or Flush Left. Replacement Inserts available in 8"W X 2"H size and 10"W X 2"H size. Desk Sign with Frame and Slide-in Insert sold complete and Replacement Inserts sold individually. 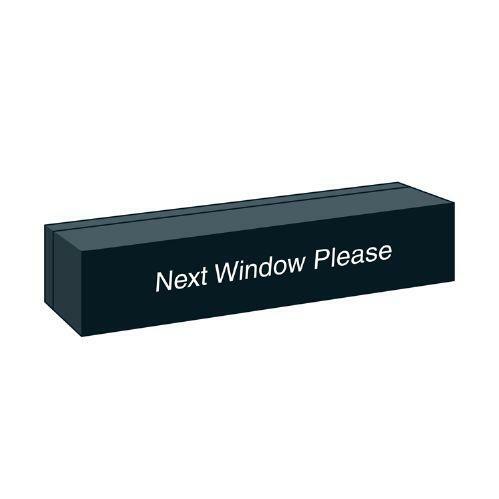 Clear Plexiglas Base size 7 1/2"W X 1 1/2"D holds Nameplate size 7 1/2"W X 1 1/2"H. Nameplates available with Engraved or Subsurfaced Engraved lettering. Signs available with one or two lines of imprint. Engraved Nameplate Inserts available in colors - Gray with black letters, Green with white letters, Cocoa with white letters, Black with white letters, Walnut with white letters, White with black letters, Red with white letters, Blue with white letters, Brown with white letters, Gold with black letters, and Silver with black letters. Subsurface Engraved Nameplate Inserts available in colors - Gray with black letters, Taupe with white letters, Black with white letters, White with black letters, Red with white letters, Blue with white letters, Brown with white letters, Almond with white letters, Bordeaux with white letters, Metallic Blue with black letters, and Gold with black letters. Imprinting typefaces available are Gothic, Gothic Italic, Helvetica Medium, Helvetica Medium Italic, Clarendon, Clarendon Italic, Optima Bold, Optima Bold Italic, Times Bold, and Times Bold Italic. Lettering cases available are Upper and Lower case letters, All Upper case letters, or All lower case letters. Position on nameplate available in Centered or Flush Left. 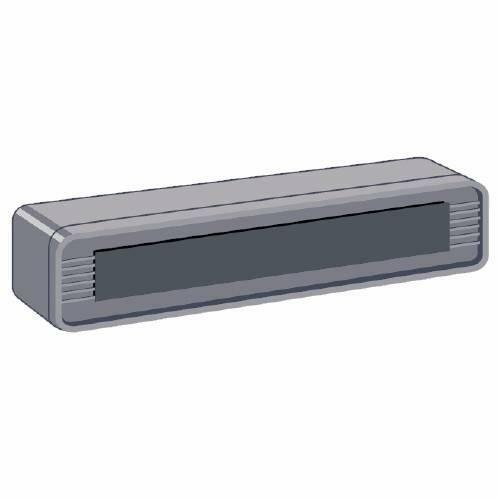 Replacement Inserts in Engraved or Subsurface Engraved styles available. 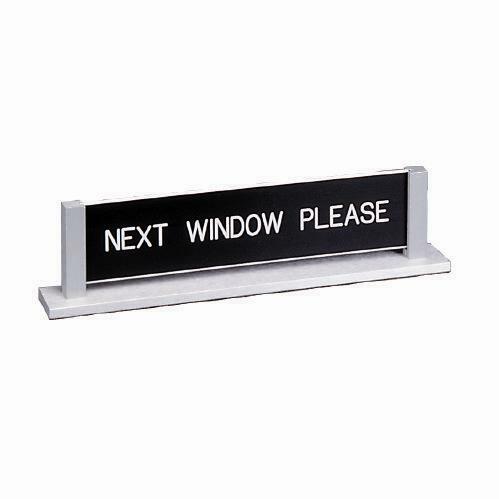 Desk Sign with Clear Plexiglas Base and Nameplate sold complete and Replacement Inserts sold individually. Magnetic Nameplates snap into Magnetic Sign Frames. Sign Frames are available in Desk Bar, Reversible Teller Bar, Desk Pedestal, and Wall Sign styles. Sign Frames and Nameplates in Square design. Nameplates are available in Vinyl Letter, Subsurface Engraved, or Engraved styles. Sign Frames and Nameplates sold separately and individually. Available in Black, Gray, Brown, and Bronze colors. Dimensions 9"W X 2"H X 1 3/8"D. Cork Base Bottom is standard. Double-Faced Adhesive Bottom is available per request. Desk Bar Frames sold individually. 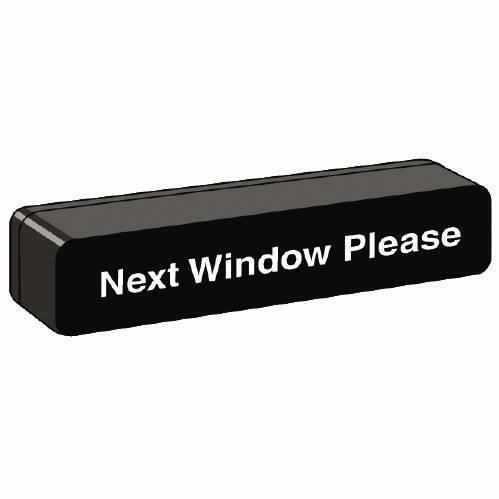 Available with Next Teller Please or Next Window Please on back of frame. Available in Black, Gray, Brown, and Bronze colors. Dimensions 9"W X 2"H X 1 3/8"D. Cork Base Bottom is standard. Double-Faced Adhesive Bottom is available per request. Reversible Teller Bar Frames sold individually. Available in Black, Gray, Brown, and Bronze colors. Dimensions 9"W X 2"H X 3/8"D. Cork Base Bottom is standard. Double-Faced Adhesive Bottom is available per request. Desk Pedestal Frame sold individually. Available in Black, Gray, Brown, and Bronze colors. 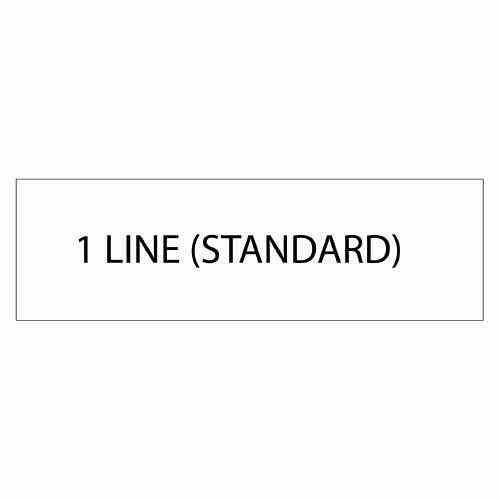 Dimensions 9"W X 2"H X 3/8"D. Double-Coated Adhesive Back is standard. Velcro Backing or Double Pin Mounting (pictured on right) are available per request. Wall Frame sold individually. Molded Plastic Nameplate with precision cut vinyl letters. Available in colors - Black with white vinyl letters, Gray with black vinyl letters, Brown with white vinyl letters, and Bronze with white vinyl letters. Dimensions are 8 11/16"W X 1 3/4"H. Signs available with one or two lines of imprint. Imprinting typefaces available are Helvetica Medium, Helvetica Medium Italic, Clarendon, Clarendon Italic, Optima Bold, Optima Bold Italic, Times Bold, and Times Bold Italic. Lettering cases available are Upper and Lower case letters, All Upper case letters, or All lower case letters. Position on nameplate available in Centered or Flush Left. Nameplate sold individually. Molded Plastic 2/3 Nameplate with precision cut vinyl letters. Molded Plastic 1/3 Logo Inserts with silk screened ink imprint of either FDIC Logo or NCUA Logo. 2/3 Nameplate available in colors - Black with white vinyl letters, Gray with black vinyl letters, Brown with white vinyl letters, and Bronze with white vinyl letters. 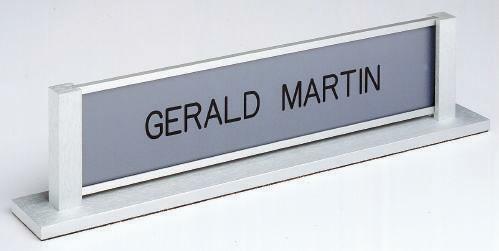 2/3 Nameplate available with one or two lines of imprint. Imprinting typefaces available are Helvetica Medium, Helvetica Medium Italic, Clarendon, Clarendon Italic, Optima Bold, Optima Bold Italic, Times Bold, and Times Bold Italic. Lettering cases available are Upper and Lower case letters, All Upper case letters, or All lower case letters. Position on nameplate available in Centered or Flush Left. 2/3 Nameplate dimensions are 5 13/16"W X 1 3/4'H. 1/3 Logo Inserts dimensions are 2 7/8"W X 1 3/4"H. 2/3 Nameplate and 1/3 FDIC or 1/3 NCUA Logo Inserts sold individually. Engraved Imprint from the back of the nameplate then covered with a blended acrylic material provides imprint protection. Subsurface Engraved Nameplate Inserts available in colors - Gray with black letters, Taupe with white letters, Black with white letters, White with black letters, Red with white letters, Blue with white letters, Brown with white letters, Almond with white letters, Bordeaux with white letters, Metallic Blue with black letters, and Gold with black letters. Imprinting typefaces available are Gothic, Gothic Italic, Helvetica Medium, Helvetica Medium Italic, Clarendon, Clarendon Italic, Optima Bold, Optima Bold Italic, Times Bold, and Times Bold Italic. Lettering cases available are Upper and Lower case letters, All Upper case letters, or All lower case letters. Position on nameplate available in Centered or Flush Left. Signs available with one or two lines of imprint. Nameplate sold individually. Engraved Imprint from the back of the 2/3 nameplate then covered with a blended acrylic material provides imprint protection. 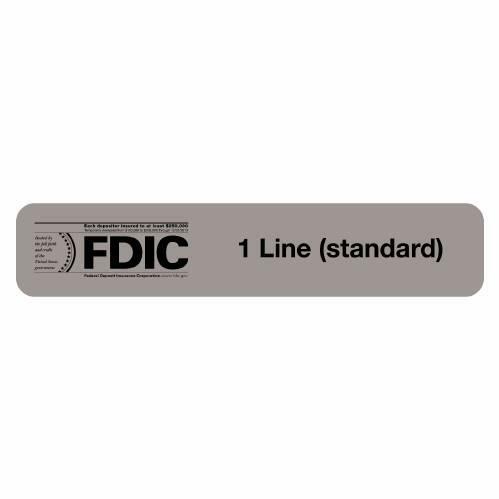 1/3 FDIC Logo Insert or 1/3 NCUA Logo Insert in silk screened ink imprint with blended acrylic material provides imprint protection. 2/3 Subsurface Engraved Nameplate Inserts available in colors - Gray with black letters, Taupe with white letters, Black with white letters, White with black letters, Red with white letters, Blue with white letters, Brown with white letters, Almond with white letters, Bordeaux with white letters, Metallic Blue with black letters, and Gold with black letters. Imprinting typefaces available are Gothic, Gothic Italic, Helvetica Medium, Helvetica Medium Italic, Clarendon, Clarendon Italic, Optima Bold, Optima Bold Italic, Times Bold, and Times Bold Italic. Lettering cases available are Upper and Lower case letters, All Upper case letters, or All lower case letters. Position on nameplate available in Centered or Flush Left. 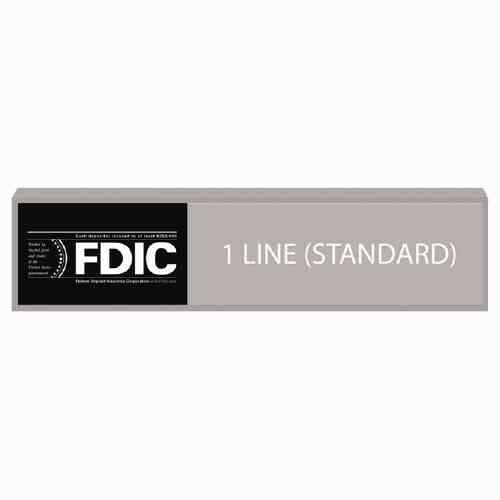 2/3 Nameplate and 1/3 FDIC or 1/3 NCUA Logo Inserts sold individually. Engraved Imprint on the front of nameplate. Engraved Nameplate Inserts available in colors - Gray with black letters, Green with white letters, Cocoa with white letters, Black with white letters, Walnut with white letters, White with black letters, Red with white letters, Blue with white letters, Brown with white letters, Gold with black letters, and Silver with black letters. Imprinting typefaces available are Gothic, Gothic Italic, Helvetica Medium, Helvetica Medium Italic, Clarendon, Clarendon Italic, Optima Bold, Optima Bold Italic, Times Bold, and Times Bold Italic. Lettering cases available are Upper and Lower case letters, All Upper case letters, or All lower case letters. Position on nameplate available in Centered or Flush Left. Signs available with one or two lines of imprint. Nameplate sold individually. Engraved Imprint on the front of 2/3 nameplate. 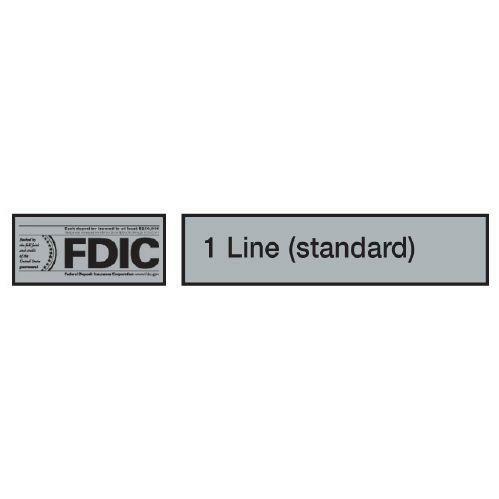 1/3 FDIC Logo Insert or 1/3 NCUA Logo Insert in silk screened ink imprint. Engraved Nameplate Inserts available in colors - Gray with black letters, Green with white letters, Cocoa with white letters, Black with white letters, Walnut with white letters, White with black letters, Red with white letters, Blue with white letters, Brown with white letters, Gold with black letters, and Silver with black letters. Imprinting typefaces available are Gothic, Gothic Italic, Helvetica Medium, Helvetica Medium Italic, Clarendon, Clarendon Italic, Optima Bold, Optima Bold Italic, Times Bold, and Times Bold Italic. Lettering cases available are Upper and Lower case letters, All Upper case letters, or All lower case letters. Position on nameplate available in Centered or Flush Left. 2/3 Nameplate and 1/3 FDIC or 1/3 NCUA Logo Inserts sold individually. Magnetic Nameplates snap into Magnetic Sign Frames. Sign Frames are available in Desk Bar, Reversible Teller Bar, Desk Pedestal, and Wall Sign styles. Sign Frames and Nameplates in Radius design. Nameplates are available in Vinyl Letter or Subsurface Engraved. Sign Frames and Nameplates sold separately and individually. Molded Plastic Nameplate with precision cut vinyl letters and silk screen FDIC Logo. Available in colors - Black with white vinyl letters, Gray with black vinyl letters, Brown with white vinyl letters, and Bronze with white vinyl letters. Dimensions are 8 11/16"W X 1 3/4"H. Signs available with one or two lines of imprint. Imprinting typefaces available are Helvetica Medium, Helvetica Medium Italic, Clarendon, Clarendon Italic, Optima Bold, Optima Bold Italic, Times Bold, and Times Bold Italic. Lettering cases available are Upper and Lower case letters, All Upper case letters, or All lower case letters. Position on nameplate available in Centered or Flush Left. Nameplate sold individually. 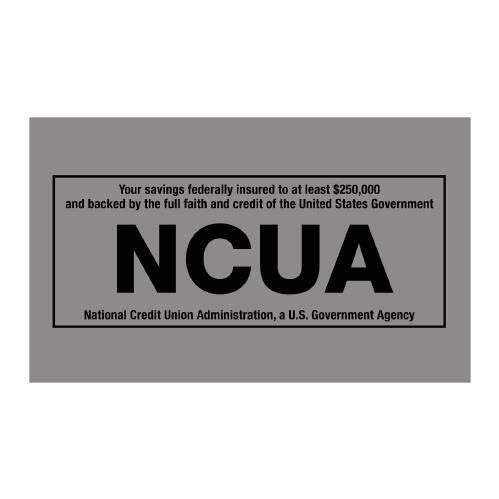 Molded Plastic Nameplate with precision cut vinyl letters and silk screen NCUA Logo. Available in colors - Black with white vinyl letters, Gray with black vinyl letters, Brown with white vinyl letters, and Bronze with white vinyl letters. Dimensions are 8 11/16"W X 1 3/4"H. Signs available with one or two lines of imprint. Imprinting typefaces available are Helvetica Medium, Helvetica Medium Italic, Clarendon, Clarendon Italic, Optima Bold, Optima Bold Italic, Times Bold, and Times Bold Italic. Lettering cases available are Upper and Lower case letters, All Upper case letters, or All lower case letters. Position on nameplate available in Centered or Flush Left. Nameplate sold individually. 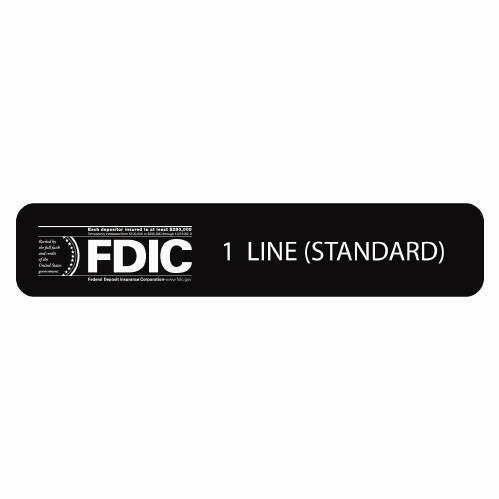 Engraved Imprint from the back of the nameplate with FDIC Logo silk screeened on front of the nameplate then covered with a blended acrylic material provides imprint protection. Subsurface Engraved Nameplate Inserts available in colors - Gray with black letters, Taupe with white letters, Black with white letters, White with black letters, Red with white letters, Blue with white letters, Brown with white letters, Almond with white letters, Bordeaux with white letters, Metallic Blue with black letters, and Gold with black letters. Imprinting typefaces available are Gothic, Gothic Italic, Helvetica Medium, Helvetica Medium Italic, Clarendon, Clarendon Italic, Optima Bold, Optima Bold Italic, Times Bold, and Times Bold Italic. Lettering cases available are Upper and Lower case letters, All Upper case letters, or All lower case letters. Position on nameplate available in Centered or Flush Left. Signs available with one or two lines of imprint. Nameplate sold individually. 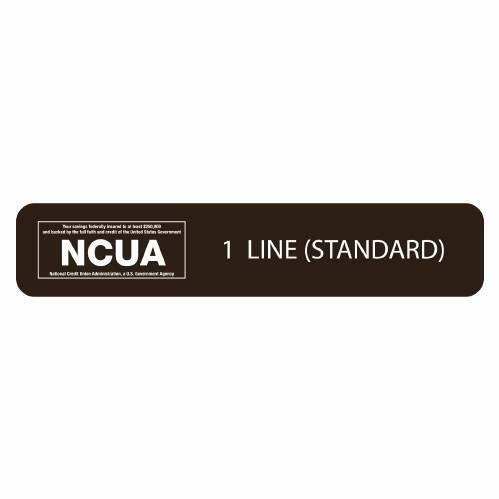 Engraved Imprint from the back of the nameplate with NCUA Logo silk screeened on front of the nameplate then covered with a blended acrylic material provides imprint protection. Subsurface Engraved Nameplate Inserts available in colors - Gray with black letters, Taupe with white letters, Black with white letters, White with black letters, Red with white letters, Blue with white letters, Brown with white letters, Almond with white letters, Bordeaux with white letters, Metallic Blue with black letters, and Gold with black letters. Imprinting typefaces available are Gothic, Gothic Italic, Helvetica Medium, Helvetica Medium Italic, Clarendon, Clarendon Italic, Optima Bold, Optima Bold Italic, Times Bold, and Times Bold Italic. Lettering cases available are Upper and Lower case letters, All Upper case letters, or All lower case letters. Position on nameplate available in Centered or Flush Left. Signs available with one or two lines of imprint. Nameplate sold individually. Additional styles of Desk Signs and Nameplates are available, for details use the Contact Us tab on our website or the contact Roger Zavodny directly by e-mail at roger@myvaultllc.com or by phone at 440-346-4593.